A most interesting map. Warmists recently have been dining out on reports of ice melting in West Antarctica generally and in the Antarctic peninsula in particular. I have always pointed out on such occasions that melting in one small part of Antarctica is hardly indicative of a global process and also pointed out the probable explanation for what is going on: Reports of vulcanism in the area. The map above now puts the matter beyond doubt. Note how hot the Antarctic peninsula is shown to be. It's full of volcanic activity. There is a mysterious line of volcanoes that have formed in certain areas of Antarctica - and could hold the key to the area's future. For years, researchers have been trying to look below the ice sheets to find out why, but due to extreme cold their technology has not been able to gather any answers. Now with the assistance of ruggedized seismometers, geologists have been able to get the first look at the mantle below the ice, revealing areas of 'hot rock'. This was the first time researchers had technology that was tough enough to withstand Antarctica’s harsh weather and the first time humans eyes have seen below this region. A giant blob of super heated rock about 60 miles beneath Mount Sidley was seen on the map. This is the last chain of volcanic mountains in Marie Byrd Land at one end of the transect. What surprised researchers the most was the hot rock beneath Bentley Subglacial Trench, a deep basin at the other end of the transect. This means the rift system just recently became active. Mount Sidley, the highest volcano in Antarctica, sits directly above a hot region in the mantle, Lloyd said. Mount Sidley is the southernmost mountain in a volcanic mountain range in Marie Byrd Land, a mountainous region dotted with volcanoes near the coast of West Antarctica. ‘A line of volcanoes hints there might be a hidden mantle plume, like a blowtorch, beneath the plate,’said Doug Wiens, PhD, professor of earth and planetary sciences and a co-author on the paper. ‘The volcanoes would pop up in a row as the plate moved over it.’ ‘But it's a bit unclear if this is happening here,’ he said. The West Antarctic Rift is less known, because it’s so hidden and leaves a lot of room for research and discovery. ‘We didn't know what we'd find beneath the basin,’ Wiens said. The rift valley was created in the late Cretaceous period, a time of diffuse extension, and more focused extension created deep basins like the Bentley Subglacial Basin and the Terror Rift in the Ross Sea. ‘This period of more focused extension likely occurred in the Neogene,’ Lloyd said. This system is known to have the most influence on ice streams in West Antarctica. The researchers believe that seismic surveys, similar to this one, will improve the models of the ice sheets, as the modelers require an estimate of the heat flow and need to know what the geological conditions at the bottom of the ice are in order to estimate drag. In July, scientists reported the heat flow at one of these spots was four times higher than the global average, which raised the question to why the reading was so high. Researchers think this recent extension in the Bentley Subglacial Trench might explain these findings. 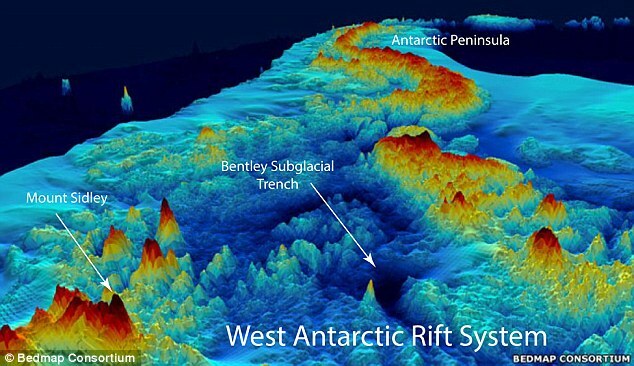 The second issue was understanding the structure under the Thwaite and Pine Island Pine Island glaciers, which are closer to the shoreline than the Bentley Subglacial Trench. The two glaciers have been described as the ‘weak underbelly’ of the ice sheet because surges in the ice flow there could possibly cause the rapid disintegration of the entire West Antarctica ice sheet. The 1997-8 El Niño killed 20,000 people and caused almost $97 billion of damage as floods, droughts, fires, cyclones and mudslides ravaged the world. Now the current El Niño has surpassed the 1997-8 El Niño on a key measure, according to the latest figures released by the US National Oceanic and Atmospheric Agency. El Niño occurs when warm water that has piled up around Australia and Indonesia spills out east across the Pacific Ocean towards the Americas, taking the rain with it. A key measure of its intensity is the warmth of water in the central Pacific. In 1997, at its peak on 26 November, it was 2.8 °C above average. According to the latest measurements, it reached 2.8 °C on 4 November this year, and went on to hit 3.1 °C on 18 November – the highest temperatures ever seen in this region. The temperatures in the central Pacific have the biggest impact on the global atmospheric circulation, and therefore the biggest impacts on global weather, says Timmerman, who has been warning that this El Niño is likely to be a record-breaker. The event hasn’t broken temperature records across the entire eastern Pacific, but in the central eastern Pacific. “It’s shifted into an area where most likely the atmosphere will respond even more,” Timmerman says. Timmerman and others showed in 2013 that El Niños have been stronger in the last few decades than in any period over the past four centuries. It is unknown whether that’s because of climate change, but Timmerman and colleagues have also shown that extreme impacts from El Niño’s will double in frequency this century as a result of climate change. In similar findings, Scott Power at the Bureau of Meteorology in Australia and colleagues showed that climate change will amplify the way that El Niño redistributes rainfall, making droughts and floods worse. El Niño has been implicated in a host of extreme weather events across the globe. Combined with global warming, it’s partly responsible for 2015 being the hottest year on record. In India, more than 2000 people died in a heatwave caused by a delayed monsoon – an effect of El Niño. Now the region is experiencing unusually heavy rains as the monsoon has finally arrived – also an expected impact of El Niño. “Southern India is having a lot of rain as it goes into winter, having come out of the dry monsoon. This is only so during extreme El Niño, so it is a confirmation that the El Niño is huge,” says Wenju Cai at Australia’s government scientific research body, CSIRO in Melbourne. El Niño is also probably making record-breaking illegal fires in Indonesia worse, by reducing rainfall there. And in some Pacific Islands, water levels have dropped so much that coral reefs are exposed, in a phenomenon known as Taimasa, Samoan for “smelly reef”. New Scientist has received photographs from Guam showing this dramatic effect, only seen during extreme El Niño events. Across the globe, the El Niño has also begun a mass coral bleaching. Australia has dodged some of the worst effects of El Niño, as the Indian Ocean Dipole – an oscillation of sea temperatures in the Indian Ocean – which was amplifying El Niño, has eased off. And because of the location of the warmest water, some regions like Peru and Ecuador are also likely to experience fewer impacts. But overall, Timmerman suspects that the impacts of this record-breaking El Niño will be record-breaking too. Many of the effects are yet to come. For example, whether it will bring rains to California and relieve the drought – or even whether it will go too far and cause floods – isn’t yet known. Timmerman says the models are predicting a higher chance of rain for California. And once the El Niño is over, it might not be time for celebration, since it’s likely to be followed by a strong La Niña, which will bring roughly opposite effects to the world’s weather. La Nina’s are also expected to be about twice as common as a result of climate change this century. Talks to agree a new international deal to tackle climate change are set to overrun as many countries remain divided over the key issues. Ministers from 195 countries worked through the night as fraught discussions on how to phase out greenhouse gases and finance for poorer nations continued to stall the UN's climate summit in Paris. The talks were due to end tonight after two weeks of wrangling, but the French foreign minister Laurent Fabius, who is chairing the summit, conceded the talks would run in to Saturday. He said a final version of the draft agreement will not be produced until Saturday morning and will then be voted on by delegates. However, many countries including China and Saudi Arabia have been refusing to yield ground on key issues within the agreement. The text has already been slimmed down since the talks started from 43 pages to just 27 in an attempt to find compromises, but Saudi Arabia said it would continue to oppose the text. It fears that plans to limit global temperature rises to within 2 degrees Celsius (3.6 Fahrenheit) above pre-industrial levels could jeopardise oil production. The latest draft, which was published on Thursday night, also sets targets that would see countries attempt to become 'greenhouse gas emissions neutral' in the second half of the century by shifting to cleaner energy sources. This was target was more ambitious than in previous texts and was insisted after many countries such small island states and members of the European Union pushed for more stringent commitments to emissions cuts. Arguments over finance deals to help poor countries cope with climate change and adapt to low carbon economies has also been a major point of disagreement. The United States has said it remains opposed to any wording that might force it to give compensation to developing nations struggling to cope with the impacts of climate change as a result of past emissions by developed countries. The issue, known as 'differentiation' in United Nations climate lingo, was expected to be one of the last to be resolved. Nijar said it was unreasonable to expect countries like Malaysia to rapidly shift from fossil fuels - the biggest source of man-made greenhouse gas emissions - to cleaner sources of energy. US Secretary of State John Kerry held several meetings with ministers from around the world through the night as he attempted to haggle them into an agreement. 'We're working on it,' said Mr Kerry as he emerged from one meeting. However, Matthieu Orphelin, spokesman for the Nicolas Hulot Foundation which advises President Francois Hollande on climate change, said: 'Major countries have entrenched behind their red lines instead of advancing on compromise. Paris, the City of Light, which earned its moniker by being an early adapter of natural gas to light its public spaces, is currently hosting COP21 (the 21st Conference of the Parties) — often referred to as the UN Climate Change Conference — that aims to end the use of fossil fuels. There, more than 150 world leaders gathered under the guise of, supposedly, slowing the warming of the planet. Ask anyone on the street: “What is the big international conference on climate change, going on right now in Paris, about?” — and, assuming you find someone who actually knows it is happening, they will tell you it is to stop global warming. However, on December 4, five days into the 12-day event, Christina Figueres, the UN’s top climate change official, made clear, that the meeting isn’t “about the temperature” — which she said “is just a proxy.” Instead, she revealed: it “is about the decarbonisation of the economy” — which means ending the use of fossil fuels, such as natural gas, oil, and coal. No wonder, this year, the world leaders wanted to speak on the opening day of the conference — before the messaging got muddled by comments such as Figueres’. At the start of the show, they could wax eloquent instead of being embarrassed by the meetings’ eventual failure to produce the touted deal. Each world leader was given three minutes to speak. All followed the rules and stayed within the limited timeframe — except for President Obama. In an incredible show of hubris, he over-spoke by nearly five times what he was allotted and ignored the frequent beeps designed to signal that time is up. What did he have to say that required 14 minutes of prepared remarks? "The sea is already swallowing villages"
Despite increasing CO2 levels, the National Oceanic and Atmospheric Administration tide gauge station closest to Kivalina is in Nome, AK. It shows no sea level rise in that part of Alaska. Kivalina may face changes due to nature, but not because of fossil fuels. "Glaciers are melting at a pace unprecedented in modern times"
During his Alaska trip, Obama visited Exit Glacier, near Seward. Historians, geologists, Park employees, and glaciologists have been keeping track of glaciers for hundreds of years, and the records for Exit Glacier are no exception. The records show for more than 100 years, Exit Glacier has been retreating, but the maximum retreat rate was 300 feet per year in 1918. Last year Exit Glacier retreated a mere 187 feet. Near Exit Glacier, at Seward Alaska, sea levels, as measured by the tide gage there, are actually falling. Similarly, in Glacier Bay — which Obama didn’t see, but cruise ships frequent — retreat has slowed from its peak in the 1860s. "Submerged countries. Abandoned cities. Fields that no longer grow"
But that would be a tough sell, maybe not at the meeting in the City of Light, but to average Americans who aren’t looking for a complete transformation of the structure of the world — which sounds a lot like the goal of ISIS and its terrorist allies. Maybe climate change, or, more accurately, the proposed cure, is the biggest threat facing the world today. Leaders from around the world, including President Barack Obama, have been saying that the COP21, also known as the Paris climate conference, is the last best hope to save the planet from catastrophic warming. Evidence and observed data, however, suggest otherwise. History shows us that this isn’t the only time international leaders have cried that the sky is falling when it comes to global warming. If we do not reach a deal at this time, let us be in no doubt: once the damage from unchecked emissions growth is done, no retrospective global agreement in some future period can undo that choice. By then it will be irretrievably too late. Virtually every international global warming summit has been deemed the last chance for the world. Dismissing problems of world poverty, hunger, disease, and terrorism, leaders have claimed that climate change is the world’s greatest problem. The climate data simply does not suggest that man-made global warming should be at the top of the list of concerns. The climate models international bodies are using to justify regulations and commitments to restrict the use of affordable energy to reduce carbon dioxide are over-predicting warming. "Recent climate change literature has been dominated by studies which show that the equilibrium climate sensitivity is better constrained than the latest estimates from the Intergovernmental Panel on Climate Change (IPCC) and the U.S. National Climate Assessment (NCA) and that the best estimate of the climate sensitivity is considerably lower than the climate model ensemble average. From the recent literature, the central estimate of the equilibrium climate sensitivity is ~2°C, while the climate model average is ~3.2°C, or an equilibrium climate sensitivity that is some 40 percent lower than the model average". Although the media and international leaders have hyped the Paris climate conference as the last chance to save the planet, 2015 is not very different from most of years’ worth of failed negotiations. What is different in 2015 compared to past years is that the Obama administration is unilaterally imposing carbon dioxide regulations on America’s energy sector. The administration’s regulations on new and existing power plants are perhaps the most harmful example of Obama’s push to regulate CO2. The regulations will drastically shift the energy economy away from coal, which provides approximately 40 percent of America’s electricity. Restricting the use of that affordable, reliable energy supply will raise electricity rates, and those higher prices will reverberate through the economy, resulting in hundreds of thousands of jobs lost and tens of thousands of dollars lost for American households. When it comes to global warming, the sky isn’t falling. But if the administration continues to drive up energy costs for families and businesses with top-down climate regulations, economic growth and the rate of employment certainly will fall. Cronyism is on display here at the United Nations climate conference (COP21), as developing countries aren’t the only ones trying to cash in on carbon regulations. Companies here are bent on crafting policies with the government and international bodies that would direct taxpayer money and private investment toward their projects. Private investment dollars will follow taxpayer-funded, subsidized projects because those government programs reduce the financial risk. Those are private investment dollars that can’t be spent on other potentially promising ideas. The result is a system that rewards what the government wants rather than what the market would produce, crippling innovation, competition and growth.